October 22, 2014: Premier Mike Baird and Transport Minister Gladys Berejiklian continue to face pressure from residents and commuters over the Liberal state government’s decision to slash the Inner West Line in half with the roll out of the new timetables one year ago forcing multiple interchanges and a 80% reduction in train services for the area. A key election commitment from the Liberal party was to ‘fix the trains’ but rather than just breaking its promise, the now-government has done exactly the opposite for public transport in the area by worsening the situation. The cuts to the Inner West Line and massive reductions of train service demonstrate deliberate neglect and discrimination against the communities of West and South West Sydney. Commuters travelling both locally and into the city from stations between Homebush and Liverpool via Regents Park are now often forced to make multiple interchanges at Birrong, Lidcombe as well as Strathfield. Such destruction of public transport services have been labelled as “the worst downgrade in a generation” and the area is now known as “Sydney’s transport black hole”. Train services that only run every 30 minutes makes matters even worse as residents and commuters call on the state government to restore regular train services between Liverpool/Bankstown to City via Regents Park. The Restore Inner West Line petition and campaign founded one year ago by local resident Roydon Ng has attracted thousands of supporters from the affected areas and from the wider Sydney region. This campaign has been further in collaboration with other local residents with community meetings and rallies taking place in protest at the abhorrent lack of adequate public transport in the area. The campaign has also received support from Barbara Perry (Auburn MP), Tania Mihailuk (Bankstown MP) and Penny Sharpe (Shadow Transport Minister). 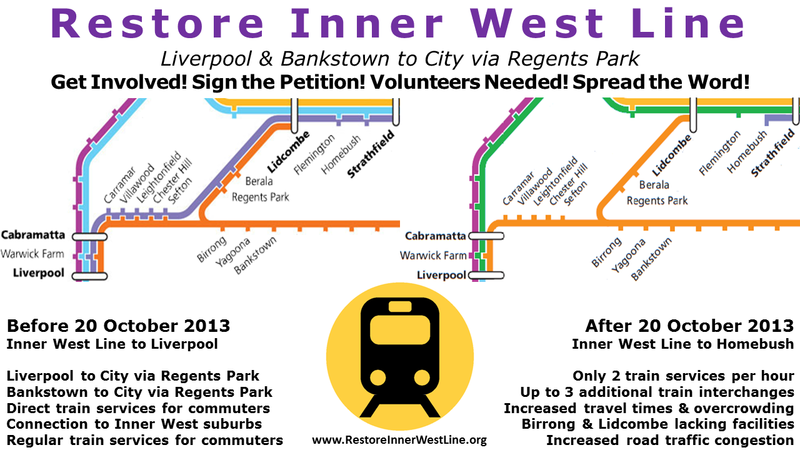 Restore Inner West Line is a non-partisan community action group & petition campaigning for the restoration of the Inner West Line to Liverpool with the reintroduction of regular Liverpool/Bankstown to City via Regents Park train services. Restore Inner West Line was started in response to Sydney Trains' 2013 timetable change. The timetable change terminated the Inner West Line at Homebush and removed all regular Liverpool (and Bankstown) via Regents Park trains. From 20 October 2013, in order to travel on the Liverpool via Regents Park route, commuters will be required to make up to 3 additional interchanges, have increased travel and wait times of up to 30 minutes. The community action group and petition organised by Roydon Ng and supported by locals MPs (Auburn and Bankstown) seeks to work with residents to campaign for the restoration of Inner West Line train services. The community is encouraged to take action through contacting the NSW Government, Transport NSW and their local MP. Restore Inner West Line has a new website! Speak with fellow commuters & residents! Restore Inner West Line: PO BOX 470 Lidcombe NSW 1825. Simple theme. Powered by Blogger.